The Miramichi Salmon Association is a non-profit group that relies heavily on fundraising to run its field programs. MSA has professional staff employed to conduct many of the programs to protect and enhance salmon stocks on the Miramichi. The greatest asset to the organization, however, is the many volunteers that give their time and efforts to raise money, debate issues, and help with programs. We invite MSA members to become actively involved in the organization by participating in an activity that fits their abilities and schedule. There are lots of programs to become involved in where you will have the opportunity to meet people with the common goal of Atlantic salmon conservation. The MSA is always looking for willing individuals or groups to volunteer and help us with our programs, if you are interested in participating in any of our programs please contact MSA biologist Kelsey McGee at (506) 622-4000 or by email. 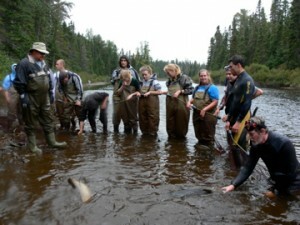 The reports listed below outline the Miramichi Salmon Association's most recent annual conservation and research programs for rivers and streams in the Miramichi Watershed. They each contain an overview of yearly activities carried out as well as text and graphical representation of the results.